Clinical documentation improvement (CDI) is just emerging in home health and hospice, and like so many changes in healthcare, it pays to stay ahead of the curve. Proper CDI helps ensure your agency doesn’t attract CMS’ attention, lets you provide better patient outcomes that are reflected in publicly reported data, and allows you to improve your agency’s productivity and efficiency. 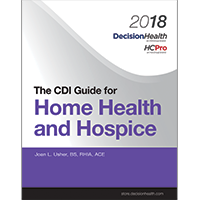 The CDI Guide for Home Health and Hospice addresses the unique challenges of both home health and hospice agencies in a practical fashion. Its expert authors and reviewers—veterans of the postacute field—provide tips on educating and querying physicians who don’t work for you, choosing home health and hospice areas to focus on, and selecting agency members for your CDI program’s steering committee. You’ll also get tools such as implementation checklists and timelines, a CDI specialist job description, and the dos and don’ts of ethical querying. Through it all, you’ll gain an understanding of the postacute PPS and public reporting systems, as well as home health and hospice compliance. The need for CDI will become clearer as consequences of poor documentation and potential fraud appear. Don’t struggle to keep up when that happens—implement a solid CDI program now and reap the benefits. Joan L. Usher, BS, RHIA, ACE, is president of JLU Health Record Systems in Pembroke, Massachusetts. Usher is a nationally recognized expert in the field of coding and health information management. 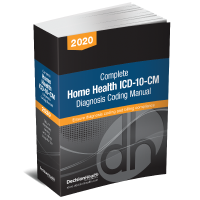 She has taught ICD coding in home health for 20 years and has educated more than 15,000 people nationwide. Her career began at a visiting nurse association, and she has been consulting for more than 25 years. Usher has been a certified OASIS specialist in the clinical realm for over nine years. She is a past president of the Massachusetts Health Information Management Association. Tricia A. Twombly, BSN, RN, HCS-D, HCS-O, HCS-H, HCS-C [Reviewer], AHIMA-approved ICD-10-CM certified trainer and ICE certified credentialing specialist, brings over 30 years of homecare experience to her role as a senior director for DecisionHealth. She is CEO of the Board of Medical Specialty Coding and Compliance and the Association of Homecare Coding and Compliance. Twombly serves as advising editor for the Home Health Diagnosis Coding Manual, technical reviewer for the Diagnosis Coding Pro Journal, and technical editor for the BMSC Online Course Libraries. She has written numerous articles and white papers and is a nationally recognized speaker in the home health and hospice industry.